I am drawn to vintage wooden boxes and other items with a lot of character. Whenever I feel the need to unwind, I head to my favorite local antique store. As you can tell from the two wooden containers in the above photo, I am drawn to vintage wooden boxes with character. I don’t always have a mission, but there are usually a few things in the back of my mind I am hoping to find. And I like a LOT of character. Some may think these wooden boxes are too distressed or too chippy. That’s a good thing to me. 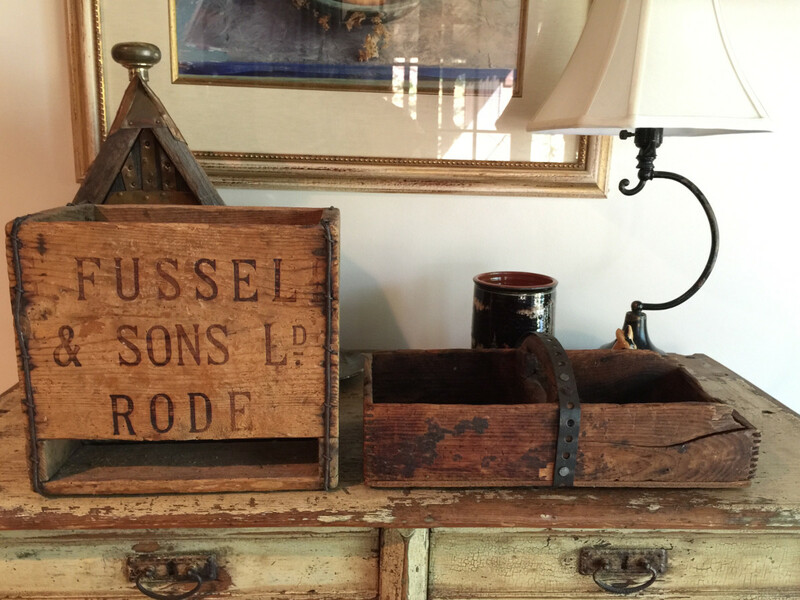 One of my wooden boxes is marked “Fussel & Sons Ld” Rode. Researching online, I learned Fussel & Sons Ldt was a brewery built in 1903 and located in the village of Rode; Somerset, England. 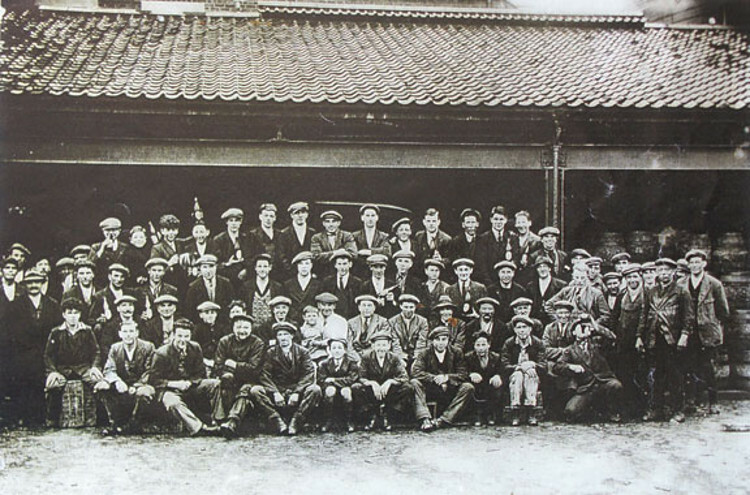 This photo of the brewery workers was taken around 1940. Markings on each end of the box state H B Milsom and Son (Bristol, England) as the maker. The interior is divided into six individual compartments. I knew exactly what I was going to do with the box when I spotted it. 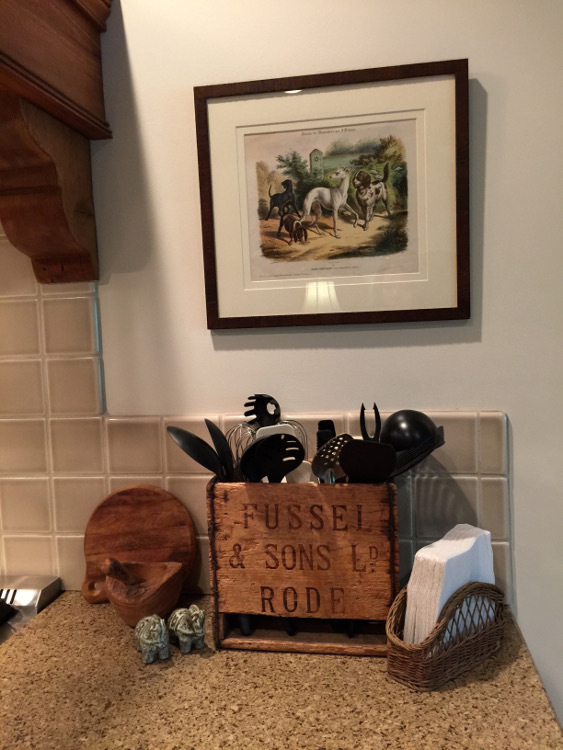 With a little elbow grease and some antibacterial cleanser the Fussel box was transformed into the perfect kitchen utensil holder. I like the way the utensils fade away, letting the box take center stage. A more recent find is a double sided box with a neat metal strip crudely nailed to its arched handle. My youngest daughter gave me that look when I told her I was going to purchase it. Now, she understands. 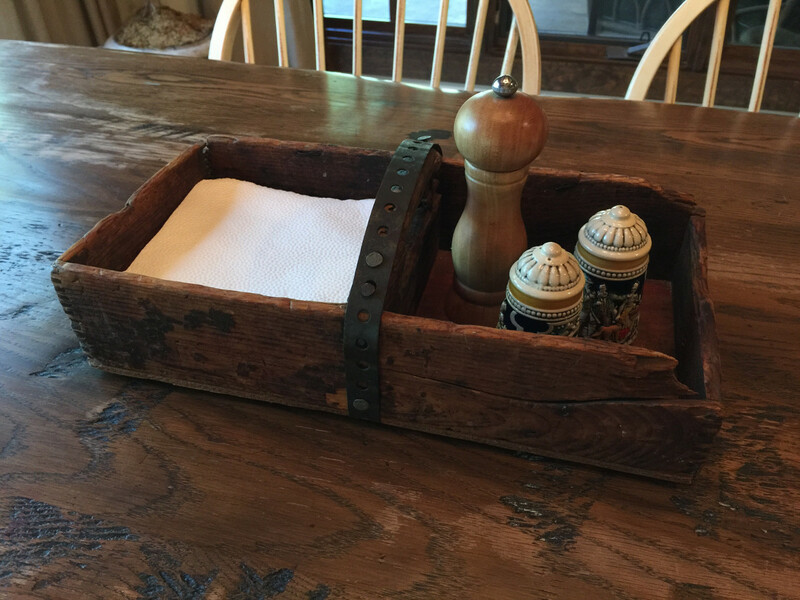 Its new home is the center of our breakfast room table and it’s been repurposed to keep paper napkins along with salt and pepper shakers close by. The salt and pepper shakers are vintage with a German feel, and were found on etsy. Here is more of my French Gray kitchen. See another of my repurposed wooden boxes. Allison, just in case you still read Atticmag, I have the same S. Fussell & Sons wooden box. It was a gift to me from one of my Fussell cousins who found it in an antiques shop. I use it in my study as a storage container for odds & ends. There are many Fussells in Louisiana, my home state. Thanks for posting Deborah. How wonderful for you to have a box too, and with the family connection! Do you sell any of your finds? I am the same way about wooden boxes! Just love them!!! Let me know too if you will be opening an online store!